Save the date: Saturday August 9th! If you're going to be in or around Toronto on Saturday August 9th, you MUST come by my studio for my New Catalogue Release Open House! There will be plenty of specials and awesome doorprizes to be won plus great sales prices on retired product and stamp sets, plus a special FREE GIFT JUST FOR COMING! You can pick up your copy of the new Fall-Winter 2008 Idea Book & Catalogue and make 2 Make & Take projects using the new "In Colors". 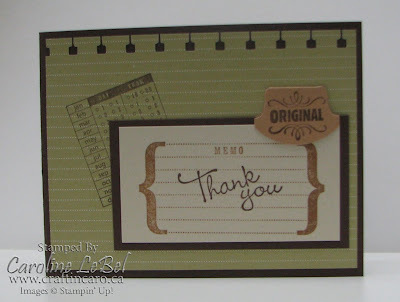 I'll also have an extra special bonus gift to anyone purchasing Stampin' Up! 's new Starter Kit -- you DON'T want to miss this event! 2243 Danforth Ave - rear studio (corner of Danforth Ave and Patricia, 1 light east of Woodbine). 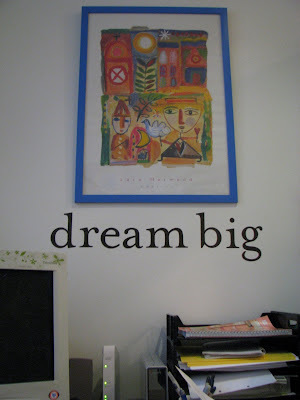 "Dream Big" -- that was the theme last year at our annual Convention. I went to Denver last July with thousands of other crazy demonstrators and had one of the BEST week's of my life there! Here's one of my favourite photos from last year...that's me in the middle in the blue dress on Awards Night surrounded by other great Canadian friends. 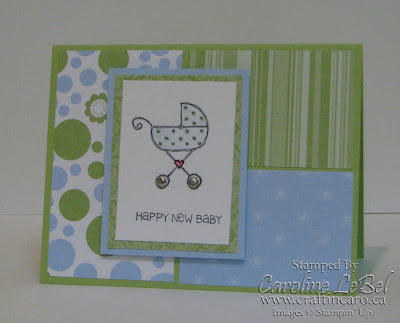 Unfortunately I'm not there this week to help celebrate Stampin' Up! 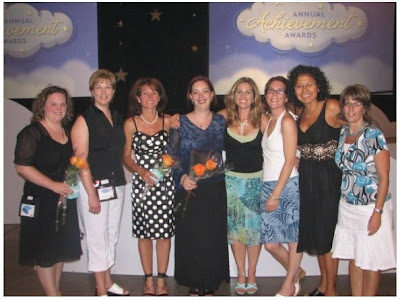 's 20th Anniversary Convention, but my friend/downline Dina is so I'm stalking her blog as she shares pictures and information with us. She just called me on my toll-free # about 15 minutes ago to give the scoop on new sets, punches, etc! 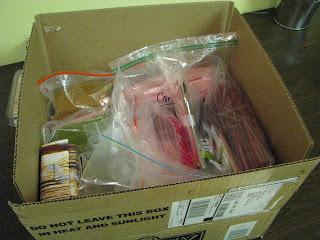 She was also sweet enough to take with her a massive BOXLOAD of swaps to swap out for me, so that I'll have loads of lovely samples to share with you all at my big Open House event on the 9th. Yipppeee! Anyhoo, the "Dream Big" idea really resonated with me, so I ordered the Lowercase Classic Alphabet Decor Element when it came out, and added my very own "Dream Big" reminder right over my desk so I can see it 8 hours a day and stay motivated. BTW, if you are interested in seeing pictures from Convention last year, I have them all in my Webshots galleries and you're more than welcome to check them out. Last but not least, let me share with you a little music for inspiration. "Dream Big" by Ryan Shupe & the Rubberband - the band that played on Awards Night. I get goosebumps whenever I listen to this... enjoy! 'Cause it will carry all your cares away. And it will help you feel okay. But when the troubles come your way. 'Cause when you dream it might come true. But when you dream, dream big. " 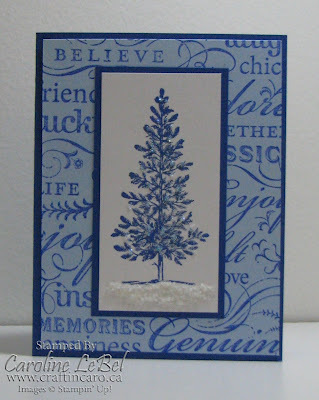 The first Purely Pomegranate & Groovy Guava card was CASE'd by a beautiful card I saw by Abbie Lockwood -- I loved the non-traditional colour combo & the use of Snow Flurries, which was a fave holiday stamp set (retiring next month). Happy stamping, kids! 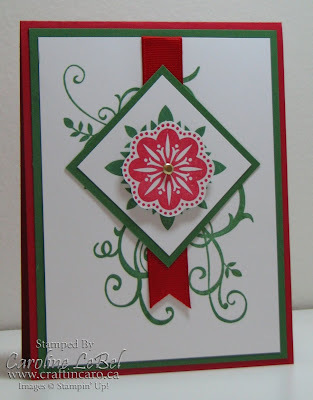 I'm trying to not get bummed out over not being in SLC with all my fellow demonstrator peeps this year for Stampin' Up! 's Convention, but I know that my friend & downline Dina will be keeping me updated!!! Christmas in July is nearly here! NEWSFLASH -- Christmas is less than 5 months away!! Shocking, isn't it?!?!?! Hahahaha, okay, not SO shocking after all. But that doesn't stop me from doing some of my favourite summer classes... Xmas in July and Xmas in August! If you want to join me, please check out my class schedule here. 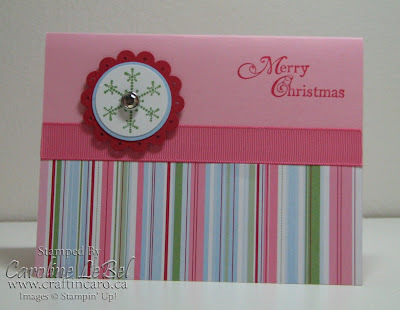 I have spots at 1pm and 7pm available for tomorrow's Xmas card class and would love to see you. In the meantime, here are 3 of the 5 cards we'll be making together -- I hope they help inspire you to get a jump start on your holiday card making too! 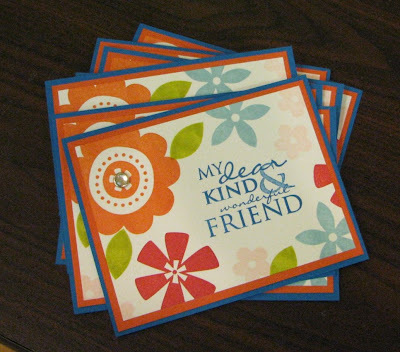 Join a fun monthly Stampers Club & get 2 free ink pads! 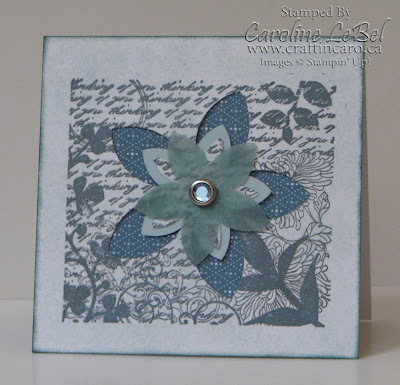 It's time to start joining up for the new Monthly Stamper Clubs, beginning in August! This coincides with the release of the new "Fall/Winter 2008 Idea Book & Catalogue" so I'll have wonderful new projects and stamps to show you. 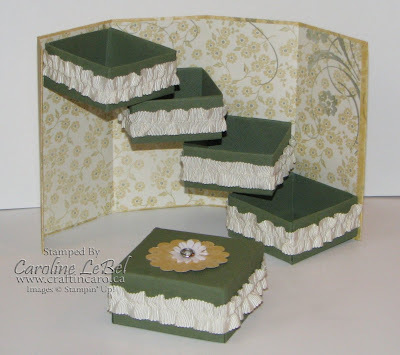 Although the monthly projects are mostly geared towards cards and 3D projects, I have many scrapbookers attend to learn the techniques to use on their personal scrapbook pages. 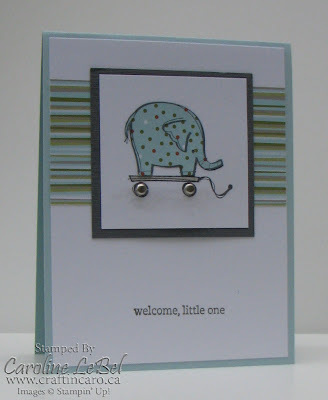 If you like stamping in any way shape or form, Stampers Club is for you! Each club will have 10 members and you will have a choice to attend one of 3 stamp playdates monthly where we'll stamp fun projects. As a club member you will get two FREE Idea Books & Catalogues -- the Fall/Winter one and then again in the Spring! Each member agrees to purchase $25 in products each month, amd will get a chance to be the "hostess" and select the FREE hostess benefits once in the 10 month period. You also have access to my exclusive Craftin' Caro Club blog, where I share all the patterns & information plus a new bonus project each month! If this sounds like something you want to do check out my Stamp Club Info Page or let’s talk at my Open House event on August 9th. Our first stamp club dates for the August 2008-May 2009 group are being held on August 13, 14 and 15th - your choice of which to attend (daytime and evening spots available). 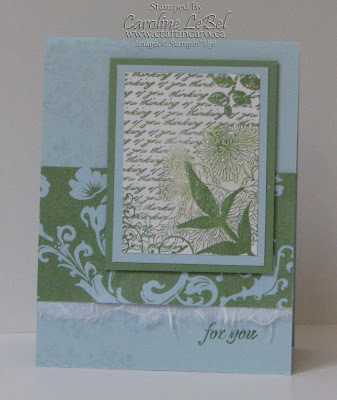 One of the projects we'll be making are the ever popular WATERFALL cards! If you can’t come on those dates but still want to be part of the club for hostess benefits, feel free to join up too! If you’ve ever been stuck looking for a last minute Birthday card, then this “Emergency Birthday Cards Kit” class is for you! 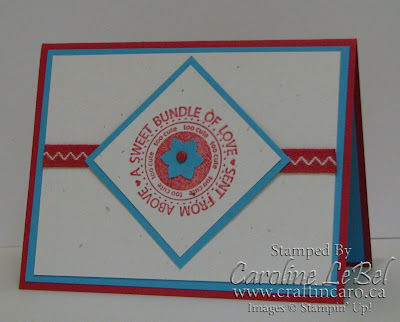 We’ll be making 2 card boxes and 12 different 3x6” cards (with envelopes) using Stampin' Up! 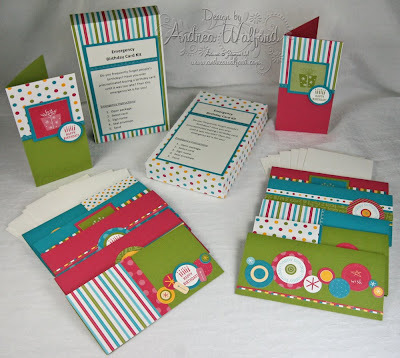 's Confetti Simply Scrappin’ Kit. Please contact me if you are interested in attending tonight's class! Over the past few years, Stampin' Up! 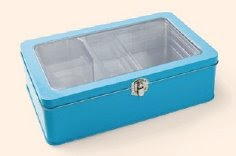 has come out with a couple of great Punch Box kits (which included a neat punch, exclusive stamps and ink spots), and I've always LOVED using the cool turquoise tins afterwards for storing some of my stamping supplies in. I have one that hold JUST my Embossing Powders, another that holds perfectly all 4 boxes of Stampin' Spots, plus my other spare was used to house a Stamping Kit-On-The-Go, with some SNAIL adhesive, Paper Snips, a bone folders and other must-haves that I need when taking a project to stamp with me. These tins are also fun to alter and customize as well... 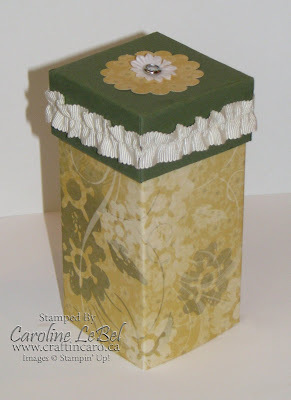 I've added Rub-on's, ribbons, DSP, chipboard -- you name it! Marker case, such as for journal pens, blender pens, aqua pens, etc. Hair clips, ponytail holders, etc. 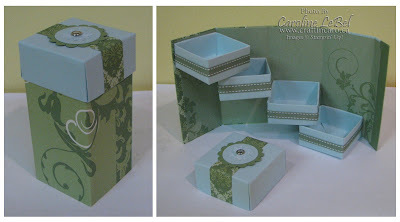 Gift box: line it with tissue paper and fill it with homemade cookies for a friend! 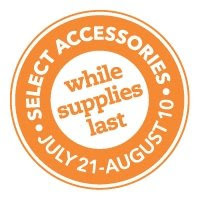 10% off Discontinued Accessories list! 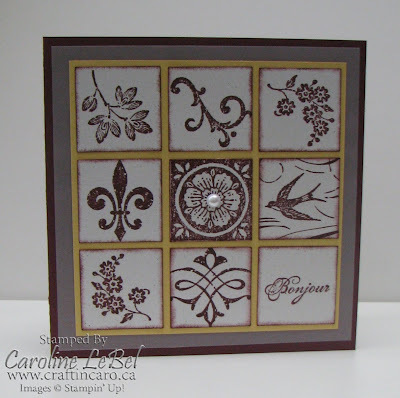 Here is Stampin' Up! 's OFFICAL Discontinuing Accessories & Wheels list for you. As all of these items are only available on a first come, first serve basis, I expect that several of these will go quickly! 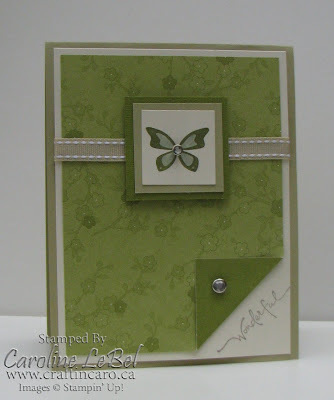 For this week only, I am offering 10% OFF any retiring accessory or stamp set. Please call or email me ASAP if you would like to order them before they're gone! Please note: all items with a SALE beside its listing is one of the special 25% off items... you can read more about those in yesterday's post HERE. This offer is valid through me in Canada only and expires on Saturday July 26, 2008. 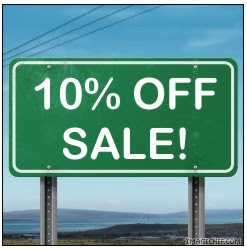 The 10% discount will be applied to any non-sales priced item. 25% off Selected Discontinued Accessories! Hello fellow stampers! 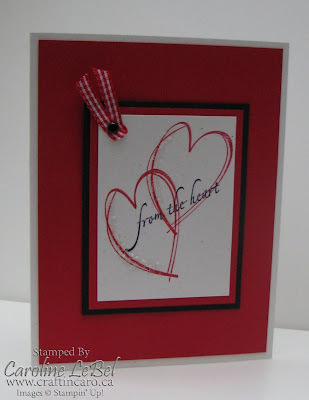 Want to save a bit of money on your favourite Stampin' Up! accessories? How about 25% off?!! Beginning Monday morning at 9am ET, the following retiring accessories will be available for 25% off their regular prices! I will be placing my first order right away and then continue placing orders as needed, since as all of these discontinung items are only available on a first-come, first-serve basis -- once supplies run out, that's it! If you live in Canada and would like anything from either the retiring accessories and/or the retiring stamp set list, please call or drop me an email and I'll be happy to help you. The rest of the retiring accessories will be posted here at 9am Monday morning, as soon as they are announced, so be sure to check back for more details! 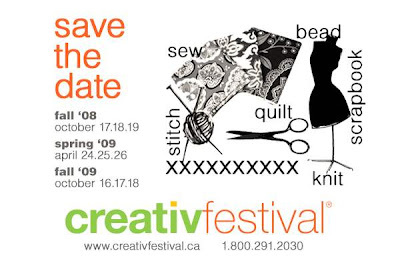 Grab your calendar and mark down the dates for the fall 2008 creativfestival! It will be at the Metro Toronto Convention Centre, South Building, Halls D & E.
I'll be at booth 391 and will have advance tickets for you beginning in early August. Bye-Bye, In Colors... they're going fast! So if you don't want to miss out on getting your favourite cardstock, patterned papers, and most importantly, re-inkers for your ink pads, don't wait -- call or email me to place your order quick! 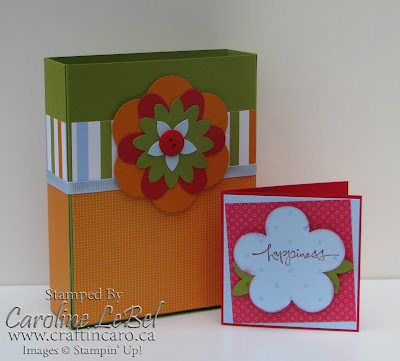 Class: Die-Cut Blooms Cards & Box! 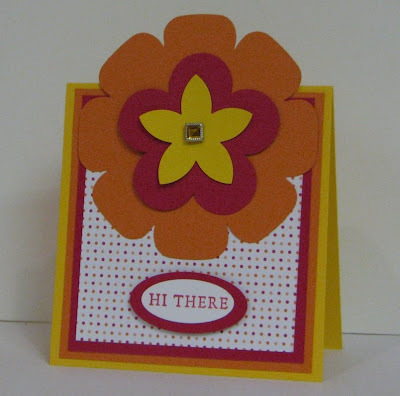 Here is one of the cards that we are making at Wednesday's Die Cut Blooms class (see another one of the cards here). 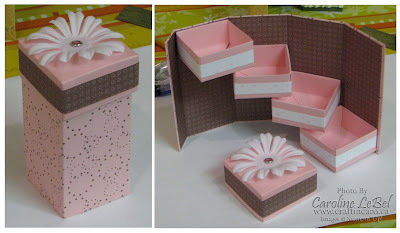 The class fee is $24.95 per person and includes a full package of the Die Cut Blooms (from the Occasions mini catalogue) that we'll be using to create cards and a cool box. If you are in Toronto and are interested in attending, I only have 3 spots left for either the 1pm or 7pm class -- just drop me a line to RSVP your spot! 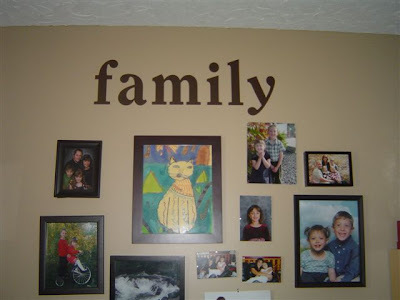 Here's one more fun Décor Element that's up in my studio for you to enjoy! 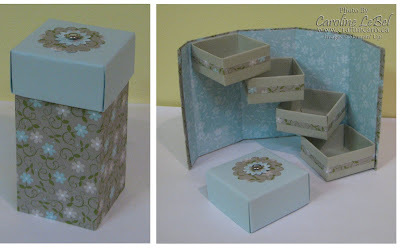 Here are 3 more Fantasy/Stepper boxes using Stampin' Up! 's Designer Papers that were made last night by some of my Club gals! #1 was by Carolynn (Le Jardin), #2 by Gillian (Berry Bliss) and #3 by Chanda (Fall Flowers). And I do mean "happy", despite the Monday part of it. I re-start my super fun and energizing Aquafit program this morning, I've climbed back on the wagon for my healthier way of eating, and am just plain feeling happy and optimistic about some other positive changes in my life. LIFE IS GOOD! 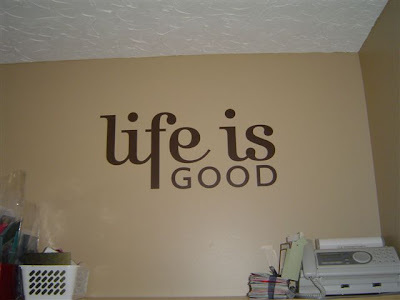 And to further play on the "life is good" theme, here are some pics that my friend Anna sent me to share. 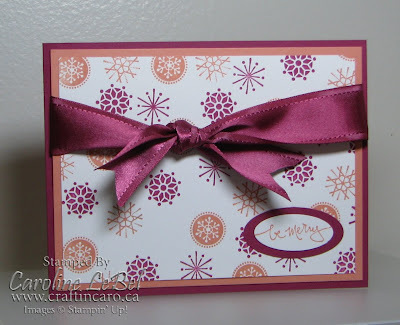 She used 2 of Stampin' Up! 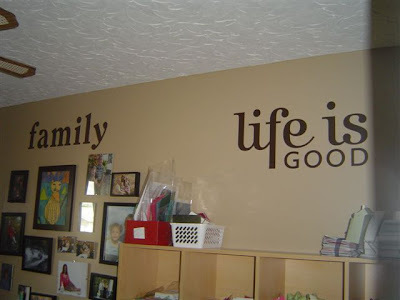 's new Décor Elements on her wall, and loves how they turned out. I do too! If you previously requested that I mail you out one of the new DE brochures, they all went out on Saturday so you'll be receiving them soon. If you live in Canada and are interested in receiving one, please let me know and I'll pop it in the mail or dropby my Toronto studio to pick one up in person. 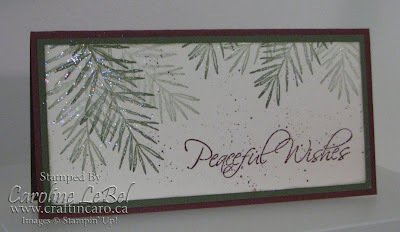 My stamping share for you today will be the 3 cards that were made at today's free "Fresh Cuts" card class. I'm going to be awfully sad when the 2007/8 In Color's retire, because I sure use those colours ALL the time, especially the pairings of Soft Sky with Wild Wasabi, and with Blue Bayou. It's a good thing that the new ones coming up are so faboo, and I'm looking forward to sharing those with you later. But in the meantime, be sure to nab some extra cardstock, ribbon and re-inkers of your favourites now because they'll soon be going bye-bye. I've been tagged by Lee!! So... now I'm supposed to tell you 7 random and/or weird things about me, link to 7 other people and then leave a comment letting them know they've been tagged. 1. Both my husband and I were born in Montreal and moved to Toronto at one year of age. We lived about 10 minutes away from each other for years! 2. My mom actually tried to set me up on a date with Brent back when I was 16 -- she was friendly with his mom & they thought it would be "fun" to get their 2 kids together. Neither of us ever remembered meeting yet we managed to find each other (independently of them) when I was 24, as we each had apartments on the same street. 3. A week after we started dating, I told her that this was the man I was going to marry. 4. 4 years and one child later, my husband proposed to me in our minivan - 2 days before Valentine's Day! 5. Of course I stamped my wedding invitations. 6. 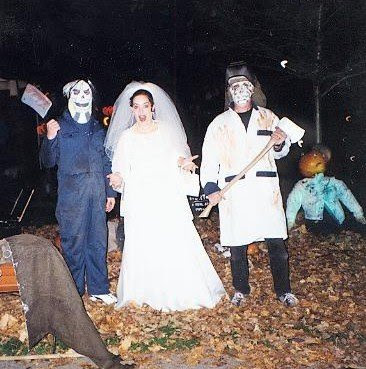 We got married on Halloween! 7. My favourite most romantic city in the whole wide world is Venice, and I'm dying to take my husband there with me one day. New Hostess Chart for Canadians! If you're looking to make some extra money, why not consider becoming a demonstrator yourself? Whether you'd like to earn money to pay a few bills, create a full- or part-time career, or simply get a discount on your stamping & scrapbooking supplies, Stampin' Up! can help you do it. I'd be happy to share some information with you if you'd like to know more, wherever you live in Canada. I hope you like the 2nd part of the class just as much -- enjoy!